Fennel seed (30%), licorice root, chamomile flower (14%), gotu kola leaf, cardamom seed, ginger root, marshmallow root (6%), ashwagandha root. 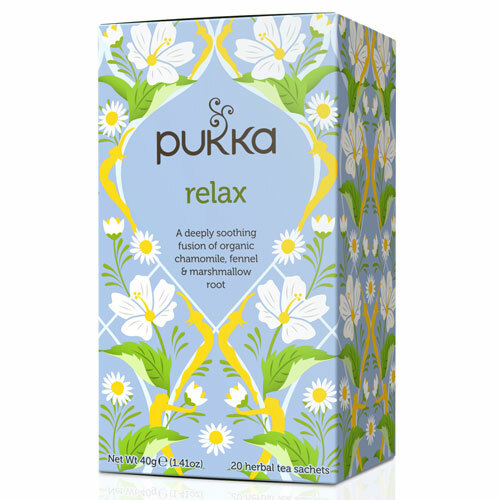 Below are reviews of Pukka Teas Organic Relax - 20 Teabags x 4 Pack by bodykind customers. If you have tried this product we'd love to hear what you think so please leave a review. As the packaging had changed I was a bit concerned the blend/taste would be different but was the same and still as good as ever!! One of my favourite pukka's!! Excellent blend of herbs - this is now my preferred bedtime drink. 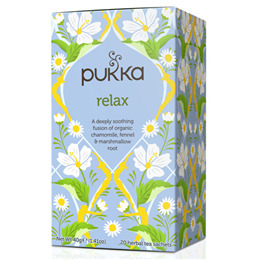 A tea to help you step back, breathe and bathe in the tranquillity of chamomile flower and the peaceful bliss of oat flowering tops, fennel seed and marshmallow root.